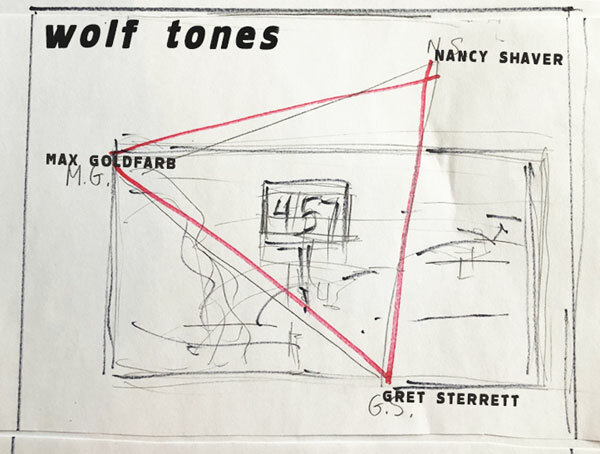 Soloway is pleased to present Wolftones, a collaborative installation of works by Max Goldfarb, Nancy Shaver and Sterrett Smith. When bowing the strings of a cello, the vibrations of certain notes resonate at the same frequencies as the vibrations of the instrument itself. The dissonant effect of competing pitches of sound are referred to as wolf tones for their howl. One might say that a conflict is exposed in the small gap between closeness and difference of temperament. Can this acoustic phenomenon serve as an analogy for describing forces at work in a visual field? A social condition? Uneasy eccentricities set off among discrete forms; complementary vibrations articulated from individualized objects. A visual charge is created when a willing vessel meets a sustaining, sympathetic tone. Reverberation! Collaboration! Yet in that specific moment of expansion, at its most amplified, a third element is activated... discord. How might the howls of a wolf be incorporated into play, into music? To calibrate this wild dog, the musician may apply a device referred to as a 'wolf tone eliminator' to dampen the vibrations. Here, in an installation that overlays varied found, representational and invented objects, one can sense the distinct bodies and impulses behind production, and the gesture of modulating the interaction of the works. Three artists collaborate here, and hope that the wolves will too. Maximilian Goldfarb is an Assistant Professor of Sculpture at the University at Buffalo Department of Art. Goldfarb has completed past works with support from the Harpo Foundation, the Elizabeth Graham Foundation, the Pollock-Krasner Foundation and the Experimental Television Center. He has participated in numerous exhibitions in venues including Sculpture Center, NY; Stadsgalerij, NL; Western Front, BC; White Columns, NY and The Drawing Center, NY. Goldfarb is co-author of Architectural Inventions (Laurence King Publishing UK), an archive of contemporary visionary architectural drawings. His project 'Repeater' is currently on view at the Nina Freudenheim Gallery in Buffalo NY. Nancy Shaver has shown in New York City for more than 40 years. Her work was included in a 2015 exhibit at the Museum of Modern Art (Robert Gober: The Heart is Not a Metaphor), La Biennale di Venezia in 2017, and more recently (2018) in two national group shows –Outliers and American Vanguard Art at Washington, D.C.'s National Gallery curated by Lynne Cooke and Helen Molesworth's final show at LA MOCA, One Day at a Time: Manny Farber and Termite Art. A co-founder of Hudson, New York's Incident Report, Shaver has been teaching in the Bard College MFA program for more than 20 years. She is a resident of Jefferson, N.Y. She is currently represented by Derek Eller Gallery in New York. Sterrett Smith is an artist in New York.